The use of marginal kidneys or kidneys with pathologic problems (such as renal artery aneurysms in a living or deceased donor) is on the rise due to organ shortages and improvements in surgical techniques. When renal vascular abnormalities are detected during a transplant, it puts the surgeon in a difficult position to decide what to do with the organ. In this study, we report a case of a kidney from a deceased donor who had 2 renal artery saccular aneurysms, which we were able to use for transplant. The recipient was a 61-year-old male patient with diabetic nephropathy and significant comorbidities. Kidney transplant was performed successfully with a good outcome. Recent advancements in surgical techniques have allowed the use of kidneys with renal artery aneurysms for kidney transplant, thus helping to overcome shortages of transplantable organs. Here, we report a case of renal transplant from a deceased donor with renal artery aneurysm. After back-table resection of the aneurysm and artery reconstruction, kidney transplant was performed. A 43-year-old female donor who suffered from brain death was encountered during organ retrieval. 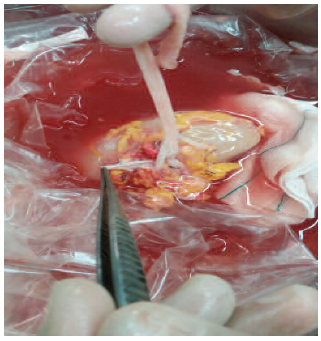 We incidentally found 2 saccular aneurysms while preparing the deceased donor’s grafts for transplant on the back table. One aneurysm was 1.5 × 1.5 × 1 cm on the bifurcation of the right renal artery, and the other was 1 × 0.5 × 0.5 cm on the secondary branch. However, the decision was made to use this kidney after removing the aneurysm. Laboratory exam­inations showed normal serum creatinine levels (0.8 mg/dL) with good urine output before organ retrieval. After resection of aneurysms was completed, 4 branches of the renal artery remained intact. The kidney and branches were implanted on the recipient’s external iliac artery, one end to end and the others end to side by Prolene 7/0 suture (Figure 1 and Figure 2). The recipient was a 61-year-old male hemo­dialysis patient who required dialysis due to secondary diabetic nephropathy. He also had coronary artery disease, which had required coronary artery bypass grafting 14 years previously. The patient also had hypertension and diabetes mellitus for the past 8 years with chronic kidney disease for 1 year; end-stage renal disease was diagnosed 6 months before transplant. Hemodialysis was performed twice a week. After preparation, the renal allograft was implanted in the right iliac fossa, and its vessels were anastomosed end-to-side to the external iliac vessels, with an extravesical ureteroneocystostomy perfor­med for bladder anastomosis. At our center, we obtain written informed consent from all patients undergoing renal transplant. After the transplant procedure, the patient had a complication-free course, with no diuresis problems and no more need for hemodialysis. Posttransplant ultrasonography showed good flow for both the renal artery and vein. During the first 10 days, color Doppler ultrasonography showed good organ vascu­larization without an anastomotic leakage or hilar collection; the blood flow in the restored tract was excellent. Delayed posttransplant graft dysfunction was not detected. The patient was discharged after 10 days with a creatinine level of 1.6 mg/dL, which had decreased from a baseline of 7 mg/dL. Main renal artery and vein and intraparenchymal branches were left intact without any sign of thrombosis or rise of peak systolic velocity in arteries. A renal arterial resistive index of 0.57 to 0.62 in the main renal artery and intraparenchymal branches was observed. The patient’s immunosuppressive therapy first included methylprednisolone at 250 × 3 per day and thymoglobulin at 1 mg/kg × 3 per day. Maintenance therapy included cyclosporine, mycophenolate mofetil, and prednisone; other medications were valganciclovir and cotrimoxazole. 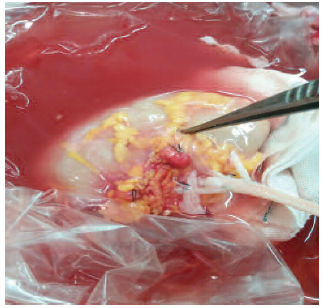 The follow-up included sequential ultrasono­graphic examinations, confirming good-quality anastomosis and the arterial patch. This is the first case of kidney transplant from a deceased donor who presented with renal artery aneurysm at the Shiraz Organ Transplantation Center. Organ shortages because of increased demands for transplant and advances in surgical techniques have necessitated the use marginal organs. One such marginal organ is kidney with renal artery aneurysm that can be repaired with micro­surgery techniques on the back table. Hence, patients who have renal artery aneurysms may consider kidney donation for therapeutic option. This option is advantageous and safe for the donor and also helps to increase the organ transplant pool. Paloyo S, Sageshima J, Chen L, Burke GW 3rd, Ciancio G. Aneurysmectomy with partial nephrectomy on a living donor renal allograft: a case report. Case Rep Transplant. 2013;2013:791413. Jung CW, Park KT, Kim MG. Experiences of renal transplants from donors with a renal artery aneurysm after a laparoscopic donor nephrectomy and ex vivo reconstruction of the renal artery. Exp Clin Transplant. 2013;11(4):324-326. Tzvetanov I, Spaggiari M, Jeon H, et al. Renal artery aneurysm in robotic donor nephrectomy: a case report. Exp Clin Transplant. 2012;10(3):293-295. 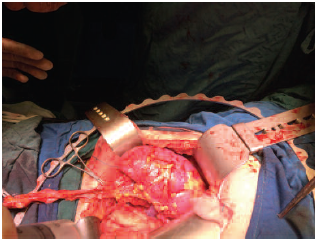 Olakkengil SA, Mohan Rao M. Transplantation of kidneys with renal artery aneurysm. Clin Transplant. 2011;25(5):E516-519. De Rosa P, Russo E, Altieri R, et al. Saccular aneurysm of graft renal artery: case report. Transplant Proc. 2011;43(4):1213-1214. González J, Esteban M, Andrés G, Linares E, Martínez-Salamanca JI. Renal artery aneurysms. Curr Urol Rep. 2014;15(1):376. Nahas WC, Lucon AM, Mazzucchi E, et al. Kidney transplantation: the use of living donors with renal artery lesions. J Urol. 1998;160(4):1244-1247.